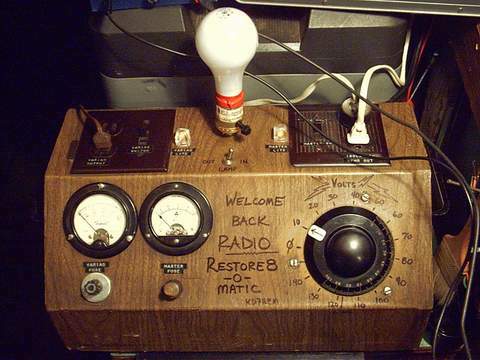 You're scrounging around your grandparents attic and find, under strata of dust, that old radio on which they used to listened to reports of the war. You blow, or even shovel, the dust off...look at the cord which seems intact and unfrayed...look over at the wall outlet and wonder...hmmm let's see if it still works. STOP! "STEP AWAY FROM THE OUTLET!" 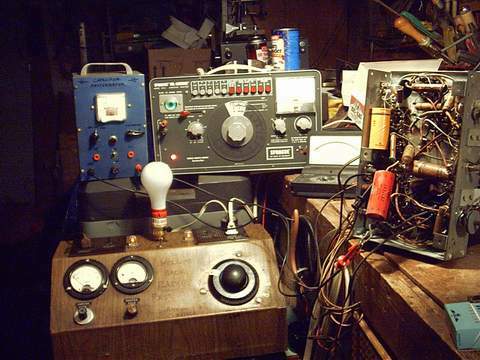 I subject it to my "Restor8-O-matic"
A combination of an isolation transformer, a variac (variable AC voltage source) and a simple 3-way light bulb (plus a few fuses and meters thrown in for good measure.) This allows me to not only bring the voltage up slowly, but to monitor and control the current flow. The reason all this is important is that as a set sits for a long period of time, filter capacitors will dry out and/or become lazy and tubes can develop shorts. Capacitors are like rechargeable batteries, if they haven't been charged for a long time, they tend to forget what it's like and they can be shocked and short out. This is where the light bulb comes in, if they do short all the current goes to the bulb and doesn't damage other components. Like valuable hard to replace transformers. Also pictured above is my Sprague Model TO-6A Tel-Ohmike Capacitor Analyzer which measures leakage and other characteristics of capacitors. Next to that, my homemade 'Capacitor Mastorbator' which I use as a controlled voltage/current supply for individual capacitors. It has a switchable 0-150 and 0-450 VDC meter.